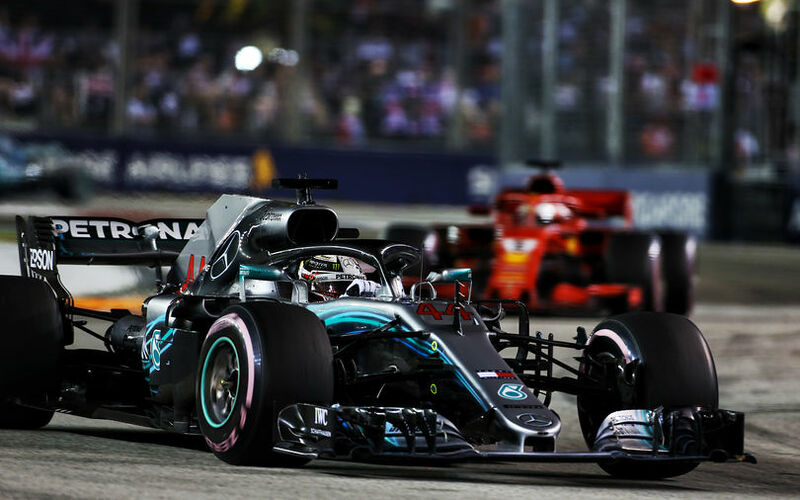 Lewis Hamilton has won the Singapore Grand Prix in a dominating fashion, with only Verstappen briefly looking into a chance for victory. The Dutch Red Bull driver eventually finished 9s down in second, while Vettel ended up third, 30s further down the road. As the lights went out, all drivers managed get off the starting line without problems, and ended up going through the first corner without hitting one another. Even though that saw no position changes in the top 8. Vettel did however enjoy a better getaway than Verstappen, but with the Dutchman on the inside of the first corner, he maintained the advantage, only to lose it to Vettel anyway 6 Turns further down the track. Moments later, the safety car was brought out on track as Perez had managed to bump his Force India team mate into the wall. Ocon was on the outside of the Mexican through Turn 3, but was squeezed and ended up breaking his front right suspension against the wall. With Ocon out, Alonso moved up to 9th after a strong start from 11th. Sainz was 10th, ahead of Hulkenberg. Gasly ran in 12th, having passed both Saubers at the start. The restart from behind the safety car on lap 5 was just a formality, with nobody managing to gain a position. By lap 12, it became clear that the front runners were all pacing themselves relative to the other in an attempt to postpone the switch from the hypersoft tyres. Alonso proved that by this time, the ultra softs were the better option, as he edged ever closer to Grosjean. The Haas driver was losing nearly a second a lap to Perez ahead of him. On lap 13, Vettel was the first to pit, switching to ultra soft Pirellis and rejoining the race in 7th, 4s down on Perez and 5s ahead of Grosjean. Mercedes reacted immediately and pitted Hamilton the next lap. Hamilton switched to the soft tyres and ended up ahead of Perez after his stop. One lap later, Grosjean pitted and made Alonso’s life a bit easier. Bottas did the same, switching to softs and rejoining the race in 7th, behind Perez who had just been passed by Vettel. Verstappen similarly opted for softs one lap later and exited the pits just ahead of Vettel. Race leader Raikkonen pitted on lap 22 and opted for a change to softs, apparently targeting to go right to the end of the race on this set of tyres.The Finn who was starting to lose nearly a second a lap to Hamilton, Verstappen and Vettel due to his older tyres, returned to the track in 6th, 3 seconds behind Bottas and 13. This left Ricciardo to lead the race on his 25-lap old hyper soft tyres. The Red Bull drivers was asked to stay out, speculating on a safety car. The only other driver using hyper softs at the time, Pierre Gasly, had just lost a position to Leclerc and Toro Rosso subsequently opted to pit him, changing to new ultra softs. Another lap later, Ricciardo pitted too and returned to the track in 6th, 11 seconds down on Raikkonen, and slower in the next few laps as well. Lap 34 marks another low point in Serio Perez’ race, as he managed to drive into Sergey Sirotkin, who he had just passed. Strangely, the Mexican turned left on a straight section, seemingly ignoring that the Russian was still aside. The incident resulted in a puncture for Perez, and an investigation from the stewards. Perez was later handed a drive-through penalty. Meanwhile at the front, the leaders were fighting their way through lapped cars, with Hamilton, on lap 36, ending up behind Sirotkin, Grosjean and Gasly, all three packed within 2 seconds. Hamilton was rightfully cautious as they cars were all fighting among each other, but that saw Verstappen close in, up to a point where Verstappen tried to pass Hamilton while being stuck behind Grosjean. Still, Hamilton was wary of the challenged and defended his line, after which the gap between the leading two increased again to 3s when they both cleared Grosjean – who later also received a 5s time penalty for ignoring blue flags. Meanwhile, as the race edged closer to its end, Bottas was starting to struggle with his tyres, resulting in Raikkonen and Ricciardo closing in. On lap 55, Raikkonen was within a second of the Mercedes driver, with Ricciardo less then 2s further down. And though his chasers edged even closer towards the end, Bottas kept his cool and finished 4th. Ahead of him were Hamilton, Verstappen and Vettel, all reasonably widely spaced one from another, having made this a slightly less spectacular race than the Singapore GP usually turns out to be. Next Next post: Fahrernoten Singapur: Jetzt Leistungen bewerten!